Zen Studios makes some cool stuff. I am a big fan of their various pinball franchises, and I also got a kick out of CastleStorm. They make tight, focused experiences that deliver exactly what is promised. They also must have one heck of a legal team, because the licenses they pull for their pinball tables are absolutely sick. Zen is moving forward with their “PC to console publishing initiative”, and the first title to be released as a result will be Out of Ammo. While we knew the game was coming, they have now committed to a date, with the title releasing for PS VR on January 30. Out of Ammo looks like a hybrid builder/shooter, with players building up their base and then jumping into first person shooter mode to battle it out in the spaces they have created. The game debuted on Steam for Vive, and currently holds a “Very Positive” rating. 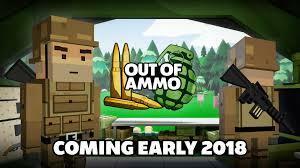 As we reported, pre-orders for Out of Ammo are still eligible to receive a free copy of CastleStorm VR, which makes Out of Ammo an especially appealing proposition.